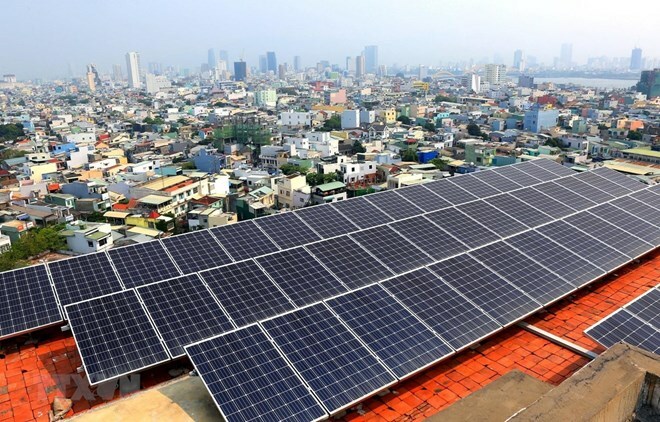 Hanoi (VNA) – Over 1,000 clients installed solar panels with a total capacity of nearly 2.5 million kWh on rooftops in 21 southern cities and provinces as of April 15, according to the Electricity Vietnam’s Southern Power Corporation (EVNSPC). The activity is meant to realise the government’s policy of encouraging and promoting the development of renewable energy. The EVNSPC said it will install electricity meters in houses to measure extra rooftop solar power and buy it from customers who are willing to sell. Under the Circular No.05 issued by the Ministry of Industry and Trade on March 11, the price of rooftop solar power will stand at 2,134 VND (0,09 USD) per kWh. Those interested could call the hotline 19001006 and 19009000 or visit the website www.cskh.evnspc.vn for consultation and support. The EVNSPC affirmed that the use of solar power will not only ease pressure on the national grid, ensure power supply for socio-economic development but also protect the environment and save costs.